This year marks the 100th anniversary of the end of the First World War and what better way to introduce this important historical event to your pupils than through poetry. 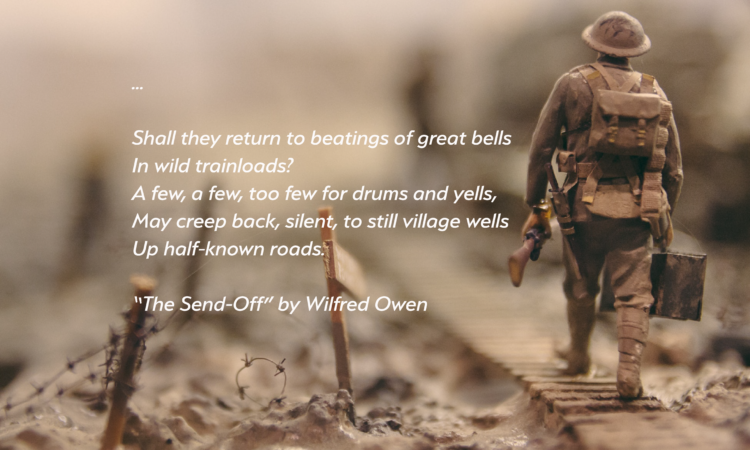 Our Curriculum Specialist James Ediker has put together a lesson plan on War Poetry for you to use as part of Literacy as well as History class. – To develop pupils’ ability to write and discuss poetry. – To educate pupils’ about the First World War and discuss its wider impact. – To develop vocabulary associated with war. – Thoroughly evaluate the video clip and select relevant information. – Independently write a war poem consisting out of 40 lines or less. – Critically assess partners work. How might you react in this situation and why? Pupils should work in groups or with a partner to review questions, or mind map their ideas. The main task of this lesson is to independently create a descriptive poem about a soldier at war. Encourage pupils to put themselves into the shoes of the soldiers. • Use interesting adjectives to describe the sounds, sights and feelings of a soldier at war. • Write no more than 40 lines. • Every word in their poem has to be spelt correctly. • The poem has to have a recognizable theme. At the end of the lesson pupils will be peer assessing their work and using this check list to mark if their partner has been successful. Ask pupils to use this source and research types of poems, this will allow a better understanding of the genre. Look at examples of the war poems in the journal so pupils get an idea of the type of language that they may wish to include. Research how the First World War inspired writers, consider and discuss how their work affected the wider world. Use this article to get started.